Close To My Heart has a very special celebration for you in November! Stampaganza will be available until November 30th, (amazingly similar to my own Mini Album Extravaganza!). 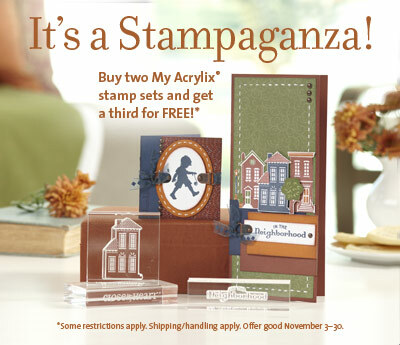 During Stampaganza, you get a FREE My Acrylix stamp set of your choice when you purchase two My Acrylix stamp sets! There is no limit to how many My Acrylix stamp sets you get FREE, so now is a great time to get those stamps for your Holiday projects and for gift giving! With so many adorable stamp sets to choose from, it will be hard to only pick three! Click on the picture, or link to take you to online ordering fast! Phst! Don’t forget that purchasing stamp set will qualify you for November’s fabulous Stamp of the Month discounted, or even FREE! Sweet! Below is the artwork! Happy Scrapping!